Will Postlethwait, president of the Rotary Club of Tucker County. 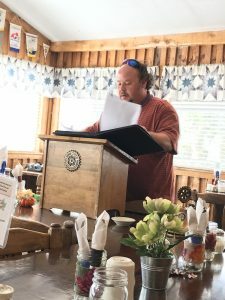 Will Postlethwait, president of the Rotary Club of Tucker County, wrapped up last minute plans with member Rotarians at Wednesday’s meeting for the club’s major annual fundraiser — the Chicken BBQ, scheduled for this coming weekend’s Leaf Peeper’s Festival in Davis, WV. Over 600 chickens will be grilled for the estimated 1,000 + visitors who will be attending the Festival and the Tucker Community Foundation’s “Run For It” non-profit event. The festival and “Run For It” 2K Walk and 5K Run will be held Saturday, Sept. 23. Autumn leaves are at their peak, and the weekend weather will be fantastic!